All cameras that in one way or another fold up to fit in your pocket. are at the top end of the design scale in my book. And then add a bell on your camera, just makes so much cooler. The Soho Myna feels quite solid. And then add that there aren’t many small pieces that can easily break off. Of course, the bell on these cameras are always a bit fragile. But if you handle it with respect, they are gonna last a lifetime. The Soho is from around 1929, that’s almost 90 years old, and the bell on mine looks like it was made yesterday. Once you get the hold of loading the 120 film. There are no challenges in using this camera. it has one shutter speed, one aperture, and two focus settings – near and far. Like with so many other cameras. I can’t remember how much I paid, but it has been worth every cent. 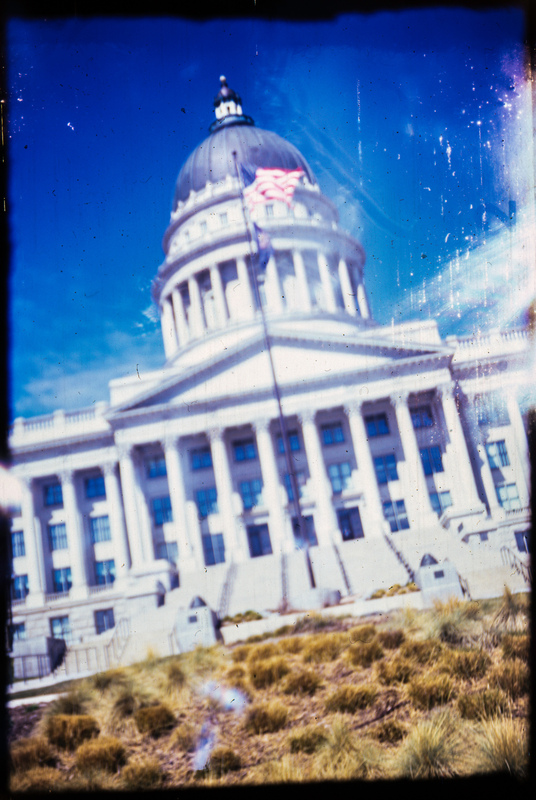 because my Soho Myna, has just all the right light leaks, as you can see on the photo – of the state capital in Utah – at the top. And look at the frame it’s just so darn awesome. is from a Red Bull “cliff” diving event here in Copenhagen, a few years back. It was really funny to see all the other photographers on site – with their big telelenses – have a look at me standing there with my 90 years old camera, capturing the action. Ok camera, when you take the age into consideration.